Isn’t this a happy quilt? 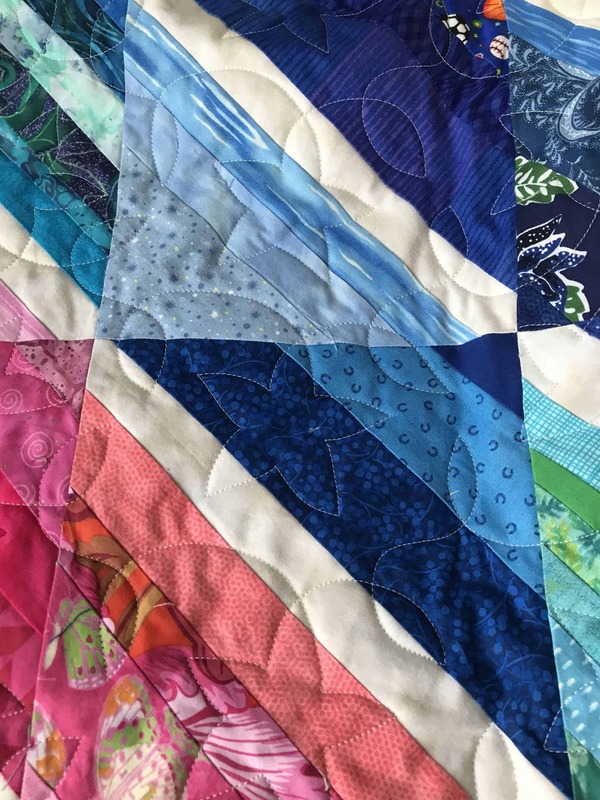 It began on a spring retreat in 2016 with members of the Rising Star Quilt Guild. I have been going for a very long time to these weekends. I love them as we sew, eat, laugh and have a great time. We also play games. That year we brought strings in rainbow colors. I no longer remember the game, but I remember the aftermath! We had piles of strings (we all brought a quart size bag of strips. At the end of the game, there are blocks that get constructed into benefit quilts. The leftovers were on the center table. Well, the compulsive among us sorted them. I couldn’t stand throwing them out, so I brought them home to make a benefit quilt. I have followed and admired Mary at Mary Quilts/Making Quilts from Stash and loved what she creates. My decision was to use up some white strings and then do whatever color family you wanted on each size. We made them on 8 1/2″ square notebook paper. Missy and Gwen are among those I know who made blocks, but I am sure there were others. They are great mindless sewing. We then came up with this design. I can’t tell you how many people sewed but everyone had fun. I love the happy star that was quilted by my friend Chris. She, in fact, is the creator of the game. For instance, one year it was a version of Chopped – a basket of mystery ingredients and you had to make a block! I found this colored snowflake backing on sale, and loved it. I think this quilt could work for either a boy or a girl and is really cheerful. If you look carefully, you can see my faithful assistant in the next picture. I know this quilt will make someone very happy and that makes me happy. 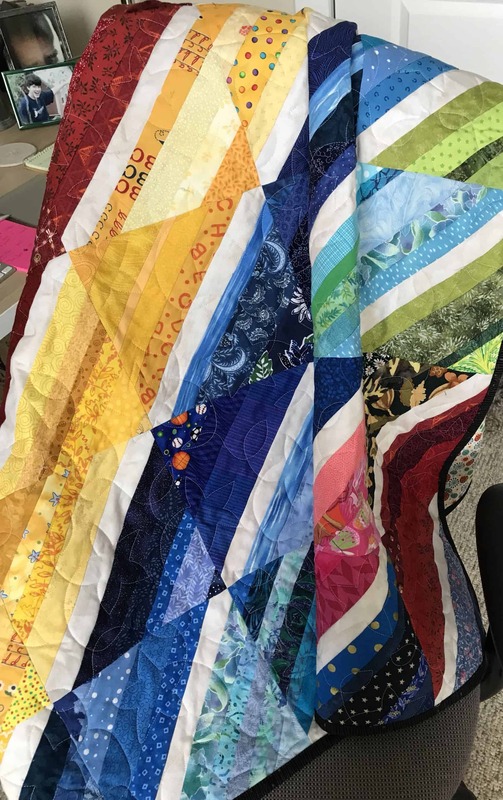 This quilt “Rainbow Strings” was on my list for the 3rd Quarter Finish Along and my One Monthly Goal. It was done Friday, but just blogging about it on Monday. 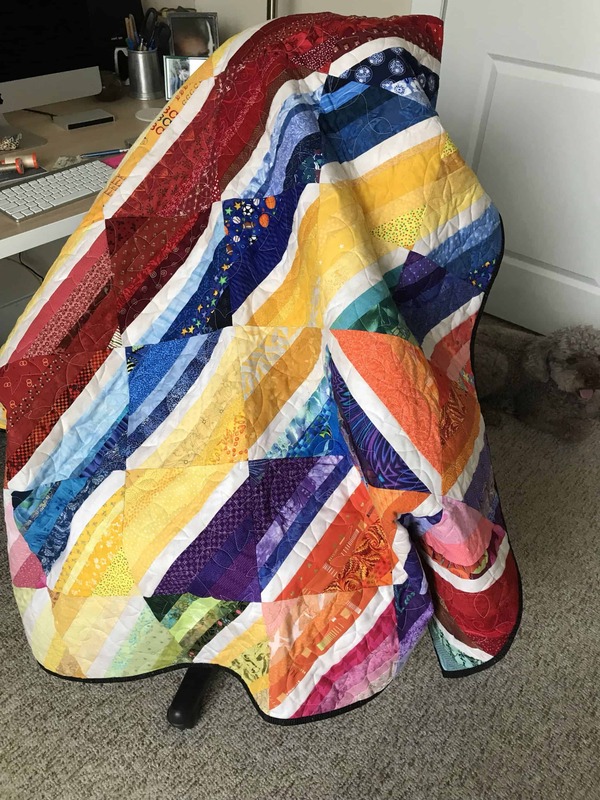 Oh, I love rainbow and this string quilt is so wonderful. Love the quilting pattern. The back is so perfect! You did wonderful. Thanks, Dawn. I am just glad to have rescued the strips and that someone will love it! I love the dynamic in these lovely bands of colour. A wonderful result from the left-overs! Thank you, Marly. It is a very lively quilt. So pleased that we rescued some of those strings. Our junior quilters got the rest. That sure is a fun and cheerful quilt! 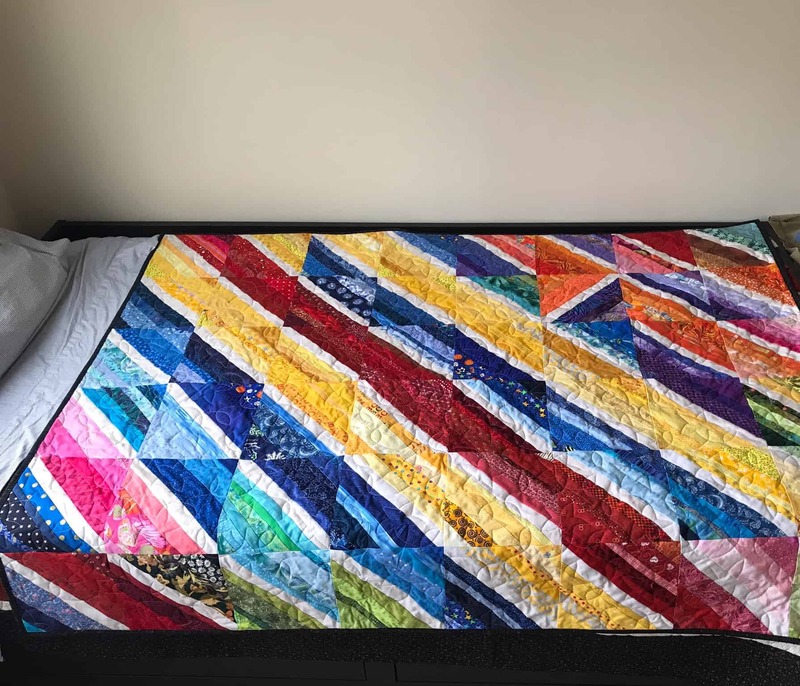 Thanks for linking up with Elm Street Quilts One Monthly Goal and congrats on your finish! You are so welcome. I love the OMG! I get more done than I would without it! What a great way to finish using up scraps. It is a very happy quilt! Happy the quilt is and happy am I for having it ready to donate! Oh yes, this quilt will definitely make someone happy. So many bright, pretty colors! It really does have so many colors. Some of them I thought were too dull but together they all work! I, too, love looking at the fabrics! Some, I recognize as things I put in the stash. 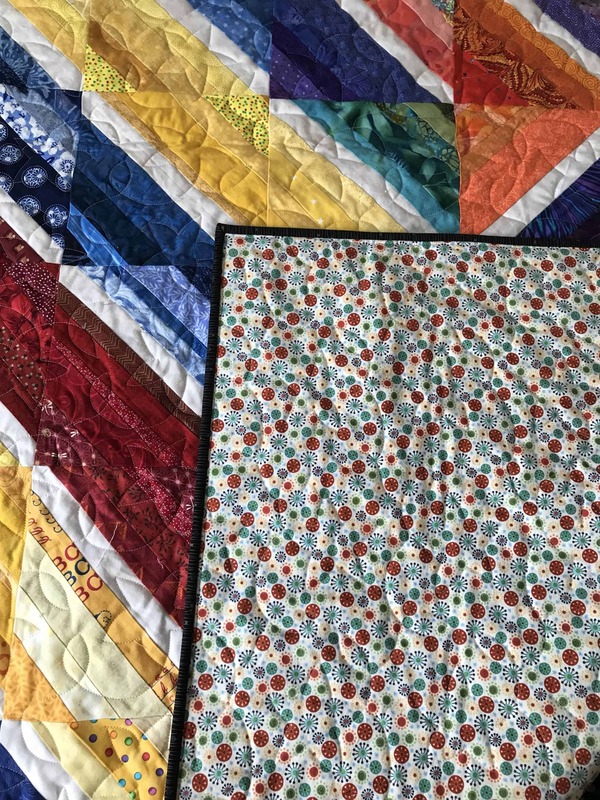 It really is a nice way to reduce some stash and make a fun quilt. Thanks, Fi! The blog was a long time coming but the last blogger adventure pushed me over the edge. I am very pleased with it – and intend to blog about it. I hope next week. The Island Batik projects are so much fun. Thanks for following along! I love how there is a strip of white fabric down the center of each block. That’s a great way to brighten up a string quilt. I think the stripe gives you a lot of options – as you can imagine. I have a few left from miscuts that I plan to do something with…someday. Beautiful quilt and lovely quilting. The colors are so cheerful. But the best part about this quilt is the celebration of the community. What a fun thing to do with your quilty friends!!! Thank you, Preeti. 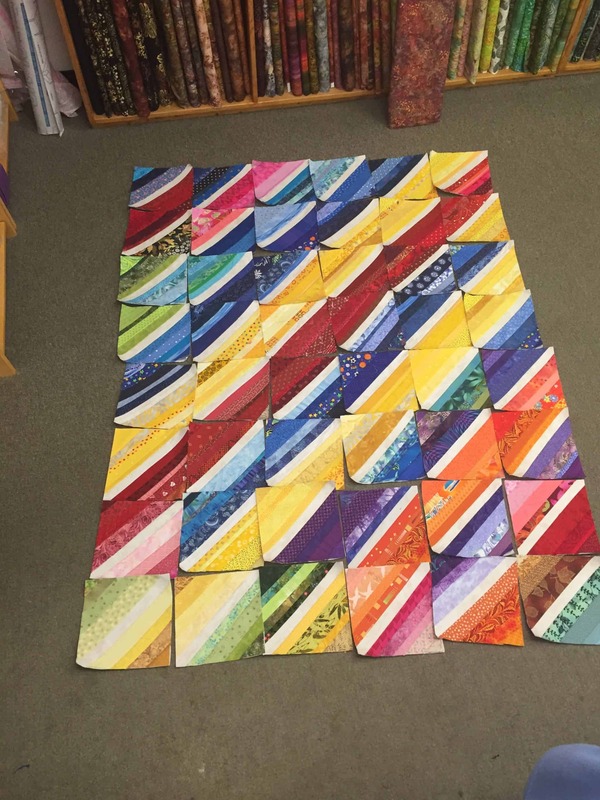 It really is fun when a group participates in a quilt that goes to someone in need. It is one of my favorite things about quilting. I love the idea that you make benefit quitls out of the strings that retreats brought and shared! On behlf of the entire FAL crew, thank you for participating in the FAL.